What has not been observed is that this shift in thinking about onshore wind has been caused predominantly by opinion changes in those over 65 years old. This chart shows the increase in the net level of support for onshore turbines. The percentage opposing wind is deducted from the percentage supporting the technology. Source: BEIS opinion tracker. 'Net support' is calculated by deducting the percentage of those opposed to wind from those who support it. This is significant because the de facto ban on large-scale onshore wind in the UK has been driven by the perceived opposition to the technology among the old, the the ruling Conservative party’s core supporters. 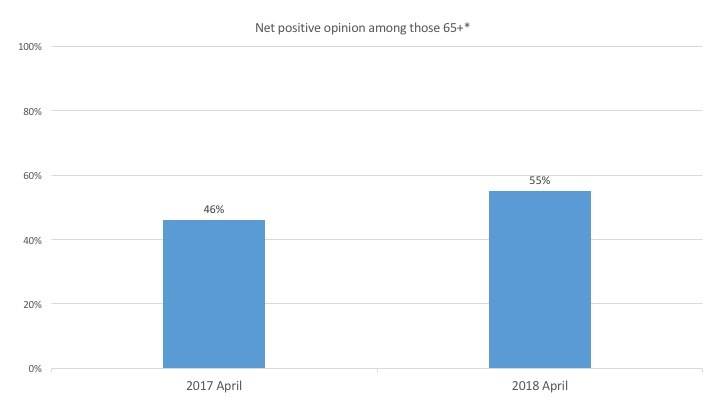 But April’s survey shows that even among those 65+, those supporting wind on land now outnumber opponents by almost 5 to 1. As it becomes increasingly obvious that onshore turbines are now the cheapest way of generating electricity, the government has no political or financial reason not to abandon its restrictive policy. I compared April 2018’s survey (Wave 25) with the figures from the April 2017 poll (Wave 21). I used the full survey datasets very helpfully provided by the statisticians at BEIS, the government department in charge of energy. · in April 2018 76% of those interviewed across all ranges support onshore wind. Of this, 30% ‘strongly support’ this method of generating electricity. Only 8% oppose wind, of which 2% ‘strongly oppose’ it. · The age of the respondent strongly predicts attitude. In the 2018 survey, over 65s were 69% in favour and 14% opposed. But among those younger than 65, ‘strong opposition’ to wind barely exists. For example, only one of the 281 people surveyed from the 35-44 age group held this view. · In previous analyses I have done of the results of this regular poll I have found that no other attribute (such as income, gender, rural/urban split) assist substantially in predicting attitudes towards onshore wind. Age drives views on turbines. · Between April 2017 and April 2018, the survey showed a rise in the percentage of all age groups supporting wind. The number increased from 73% to 76% of those interviewed. This is the highest support level ever recorded. · The increase in support from those aged 65+ was sharper; the percentage rose from about 63% to about 69%, substantially narrowing the gap between the attitudes of the old and the young. · Those opposed to wind (including those ‘strongly opposed’ and ‘opposed’) fell from 9 % to 8%, equalling the lowest ever recorded. Those against wind among the 65+ group fell from 17% to 14%. Once again, this narrowed the gap with the opinions of younger people. · Therefore the change in opinion towards a more favourable view of wind (fewer opponents, more supporters) was far sharper among the older group than the rest of the adult population. Of course it may be that the sharply reduced rate of turbine installation over the last year has reduced the salience of the debate over wind. The pro-Conservative newspapers have less to rail about. Perhaps if the current policy were changed, as shows some signs of happening, the older generation’s increasing support for wind would be reversed. But the polling trend is nevertheless clear; the government survey has been carried out for the last six years and shows a sharp increase in support for onshore turbines, even during periods of rapid turbine growth. The current policy of blocking turbines on land is now implicitly supported by less than 1 in 10 of all adults and, more surprisingly, only 1 in 7 of all those over 65. * Among other interesting results, those saying that they are thinking about buying an electric car has risen from 5% to 9% of the population over the last year.